NEW LINE! | Nan Tubre Writes . . . I am excited to show a new line I’ve been working on for a little while! Once again . . . fooling around one day and this is what I came up with . . . When I had to stop working, I took my watch off because it was an integral part of my job in health care, and to be quit honest, it kinda hurt that I wouldn’t need it anymore. I didn’t want that constant reminder. Wait. Am I being honest here?? Heck-fire, I was all too happy to take that watch off!!! And I haven’t missed it since 1997. That is until I made that one on the bottom left hand of the picture – you know – that GARNET knit bangle bracelet watch! (Oh yeah, that one’s mine!) 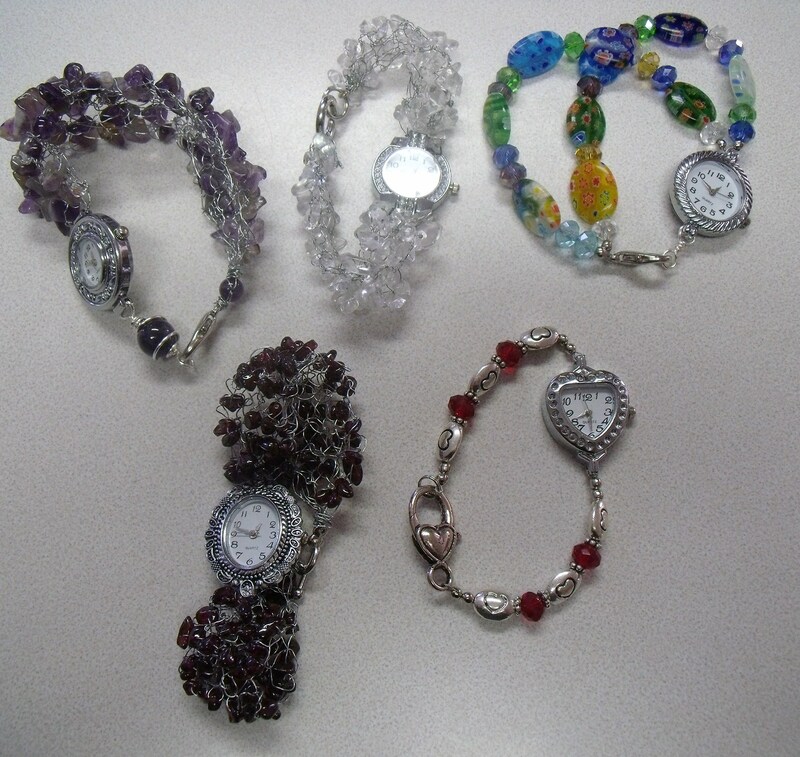 From left to right starting at the top row: Genuine amethyst bangle bracelet watch, clear glass chip bangle bracelet watch (I call it ICE ICE BABY, lol), multi-color beaded watch bracelet, there’s my garnet watch, and last a really sweet Valentine watch bracelet. I have made a couple of pink ones already but they were snapped up before they were even finished! They are strung on very strong jeweler’s wire and are so petite! The one on the left has blue Swarovski crystals and the one on the right has pearl finish glass beads. Talk about some fantastic baby shower or baptism gifts!! 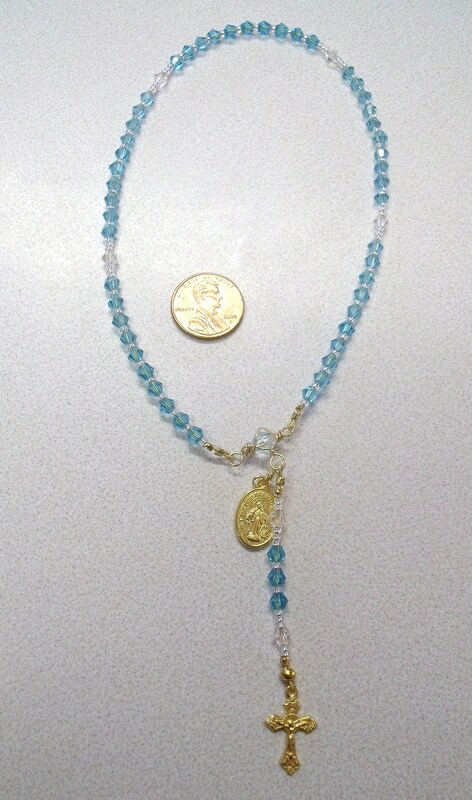 I’m seperating my jewelry line from my rosary line. I don’t know why – it jut sounded like a neat idea. Here’s a novel idea – would you mind leaving a rating or a comment if you like what you see? Look at the top of the page for the rating meter. And don’t be afraid to share my blog with your friends too. It would help my designing muse if I knew what you like – or even if this post is being read! « So, what have you been doing while I was out?